Hi Everyone! I’m going to walk you through a tricky part of using the Orton-Gillingham approach today: finding a starting point. As a teacher or tutor using the Orton-Gillingham lesson plans, you want to make the best choice for your student, but that means gathering some pieces of the puzzle that show who they are as a reader. Spending time doing that will help you make an informed decision and get your student(s) on the right track. 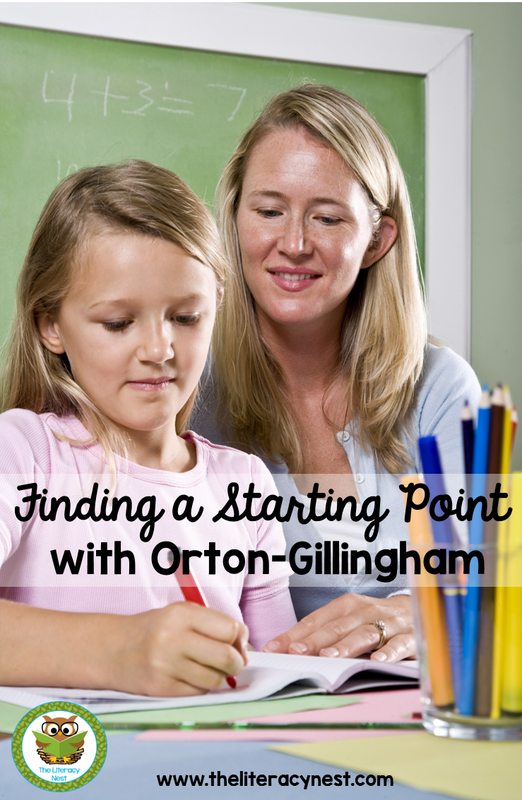 Finding a starting point is a very important step when beginning your Orton-Gillingham lessons. Having the proper tools to help you make this decision for your students is critical. I use this resource to assess my students when they are about to begin somewhere in a particular level, or are ready to exit a level. You don’t have to feel like an amateur tightrope walker when choosing a starting point, even if you’re new to using O.G. •Why is this child being recommended for Orton-Gillingham? •What do they have difficulty with in reading? •What services are they currently receiving? Are they working? If not, why? I created an assessment system called On Track to help determine a starting point for your students when using the Orton-Gillingham approach and my materials. This is only one of the tools I use when I first meet with a student. 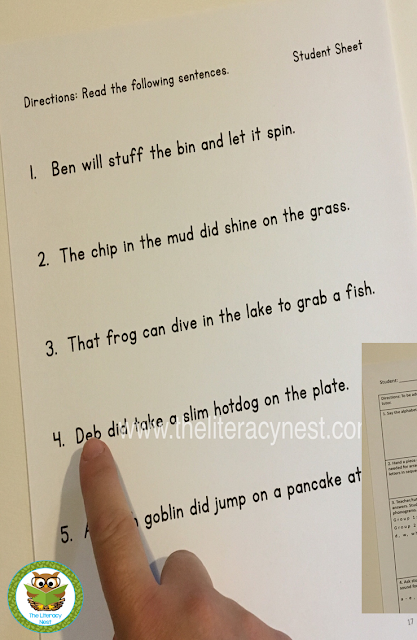 Reading assessment that includes a running record, retelling and comprehension component. Anecdotal evidence from families and teachers is also very helpful. After gathering data, I am able to make a better judgement as to which O.G. pre/post test I will need at a particular level. Using a pre and post assessment system will give you a better snapshot of your student’s reading ability. Any other testing information provided from inside or outside school along with copies of an I.E.P. will help as well. Once I administer the pre or post test, I carefully look at the errors and gaps. I use an O.G. progression chart to choose my starting point and begin planning my lessons based on my data. •Diagnose Dyslexia or other reading disabilities. 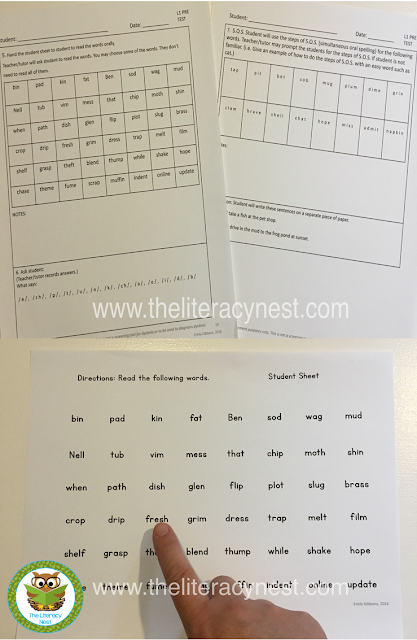 •Be used as a screening tool for Dyslexia or other reading disabilities. • I prepare a deck of phonogram cards arranged in the order of presentation to the student. I always have this ready prior to the assessment so you’re not searching for the next card in the deck. Click here to purchase a deck. •Make copies of assessments and student sheets. •Have pencils, magnetic letters and a magnetic board. •Find out whether your student is right or left handed. If they are right handed, sit beside them to their left and vice versa if they’re left handed. This is so you can observe and take notes without their hand or arm obstructing your view. •Some may like to tape record certain parts of the reading. Be mindful of your student. This might make them uncomfortable. You will notice that the On Track assessment I use follows the order of a typical Orton-Gillingham lesson plan. I chose words and sentences that follow the order of each level. It can take about 45 minutes to an hour to administer. Take your time and reassure your student that they are not being timed and to do their best. Explain that it is just a way for you to learn about them as a reader. Keep prompting to a minimum. If you are finding your student is getting frustrated at any point, use your best judgement and cut a portion of the assessment short if needed. If they are making numerous errors as you progress to harder words in any area, this is an indication of where they will probably need to start in the progression of O.G. In short, try your best to administer the entire assessment, without frustration or tears. Be sure to have a little prize or incentive when you finish for a job well done. A sticker, special pen or pencil or a piece of candy can go a long way. Please note: On the teacher recording sheets, I adjusting the spacing on the font. This is so you can make notes, mark miscues or note self-corrections as needed above or below each word. I tend to take a short time going over the assessment, finish making my notes, and then put it away. Then I go home and analyze it later. Carefully checking and analyzing each section, I look to see where the errors are with the progression chart beside me. Look for patterns in a child’s errors. I strongly suggest starting on the progression chart at the first error they make. Then your lessons will progress in that order. For example, if a child knows phonograms a, b, c, f, h, and i, but has an error at j, your FIRST O.G. lesson will be on the letter j. It’s ALWAYS better to start further back on the progression chart than to begin too far ahead, see gaps and then have to backtrack. O.G. lessons should feel EASY to a child when they begin with you. This will build their confidence. If you are administering the post assessment to see if they are ready to progress to the next level, your student should have very few errors overall. One ore two errors on a post test indicate that you can add in additional review within the next level. If there are numerous errors, it is recommended that the student remain within that level. In that case, create review lessons to reteach to mastery. Now that you have all of your data and a starting point, you’re ready to begin gathering materials for your Orton-Gillingham lessons. This is an exciting time. Remember to keep the integrity of the approach by being prescriptive, systematic, sequential, and multi-sensory. 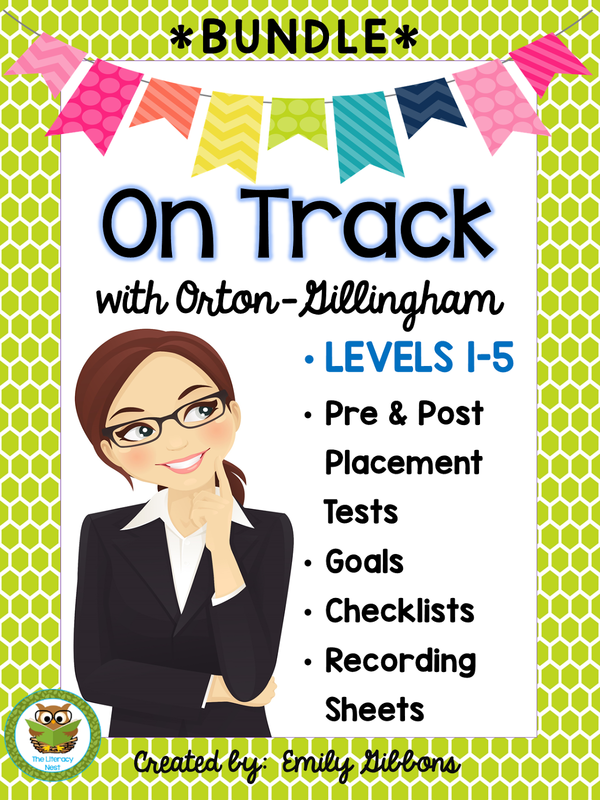 You can find the On Track assessment resource in my TpT store. Click here for level one. Check the sidebar of my blog for the heading, “Orton-Gillingham” for more related posts. Sign up for my newsletter in the right sidebar of my blog. If you are a trained Orton-Gillingham teacher/tutor, you may email me a request to join my private FB group for O.G. instructors. Looking for even more tips? 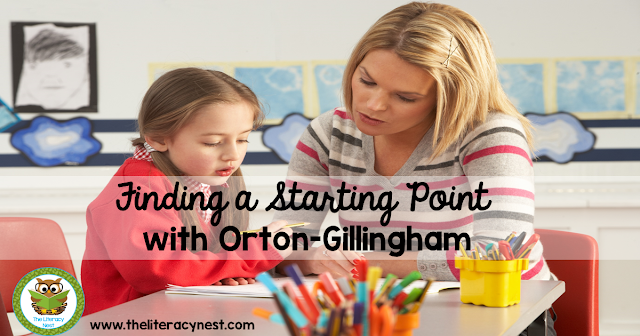 Read: “What Does An Orton-Gillingham Lesson Look Like? Have you used a similar assessment? I’d love to hear about it, so be sure to comment below. Best of luck in planning successful Orton-Gillingham lessons! One more thing! Be sure to checkout the TpT Back to School Sitewide sale on 8/1/18-8/2/18! You can save 25% everything in my store with promo code BTSFRESH at checkout. I'm a trained OG instructor. Please add me to your private list. i'm a trained OG instructor. Please add me to your private list. Thanks! I'm a trained O-G instructor beginning work on my practicum. Please add me to your private list. Thanks! I am a trained OG tutor having completed Level 1 certification. Please add me to your private FB group. I am a trained Orton tutor. Please add me to your list.